I’ve said it before and I’m sure it won’t be the last time I say it but how quick has January gone? I don’t know if its because I’ve been off work ill or just the old adage of the older we get the quicker time goes but here we are right at the end of January. I’ve shared this planner in a post a couple of weeks ago, but it is really working well for me. The idea is only to use it for Blog and YouTube things and so far, this has been the case. This is mainly because I haven’t left the house much. 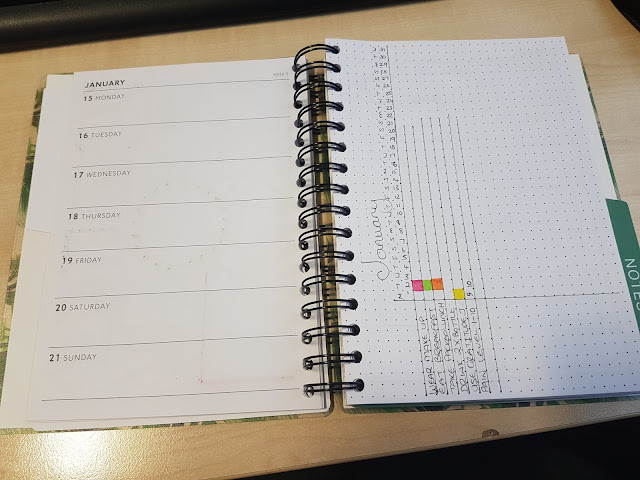 It won’t be a planner I carry around with me or use it for real life planning I don’t think but as far as January goes it’s working well. While I don’t want to be relying on them for ever, they have gotten me through this month and I couldn’t have coped with out them. I do love all fruits but a special mention to blueberries as they have now been reclassified as speed food on Slimming World. I do try and each a lot of speed foods and this has added something else I like to my list of foods to eat. While I’ve been off work, I’ve been keeping myself entertained watching Disney Vlogs, I started just watching Disneyland Paris vlogs but now I’m loving watching Walt Disney World ones as well. I especially enjoy Charlotte Ruff, A Clairytale, Steph and the Spaniels and I’ve just started watching Brogan Tate. I’ve been watching them as I’m hoping to take a trip to DLP at the end of the year and I’m getting in the Disney spirit. This is a Facebook book club I’ve joined. It’s not just for mums but it was set up by a group of parent bloggers. We’ve just read our first book, The Power by Naomi Alderman. It was a tough book and one I think I need to read again as after the discussion I feel like I might have missed some of it. We had a FB live to discuss the book and that worked so well. It helped there wasn’t too many of us in the chat as I often struggle with FB live but having that chat and reading people’s opinions and interpretations really helped. 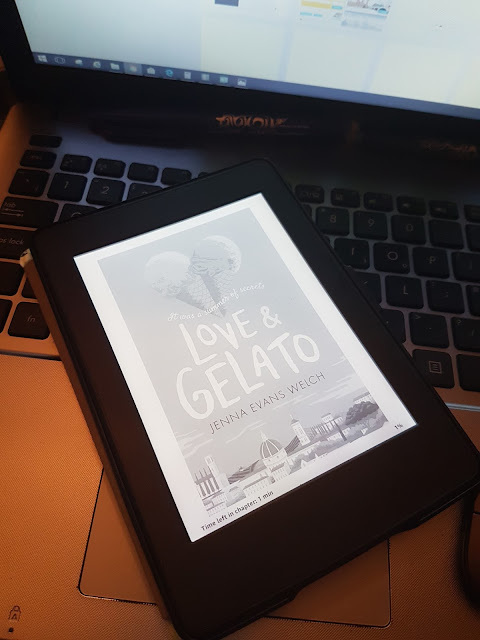 I’m looking forward to reading the next book. I’ve always been a fan of using Backpacks and tend to buy them over other styles of bags. I grabbed this one in the sale for £26 and I’m really like the print and that it doesn’t scream I’m a Cath Kidston product. This was a bargain at £5 in the sale in Primark. My only issue with this is that it’s slightly cropped. I’ve only worn it in the house so far, but it doesn’t seem too cropped, but I don’t think It’s too bad and it’s so soft and fluffy inside. Marie is possibly my favourite Disney character. I don’t really wear a lot of character clothing (I’ve got a few HP bits but not a lot of branded stuff) but with the plan of a Disney visit in the pipeline, it doesn’t hurt to have a few bits and bobs. A hand-me-down from my mum. No, not really, she’d picked up the wrong size and asked if I wanted it. I wore it for every day for about 2 weeks when I got it at first. I almost cried when I finally decided it needed a wash. It’s soft and fluffy but it has gone bobbly very quickly. I love that it has pockets and I don’t care about the bobbles, I feel like I want it in other colours. I did spot it in black last week. I’ve been meaning to talk about these for quite a while, but these must be the best nail polish I’ve used in a long time if not ever. My nails must be oily or acidic or something, but nothing ever sticks, it either wears off or chips quickly and even gel nails just peel off within a couple of days. It’s very quick drying and a lot of the shades only need one coat. I’ve had a couple of these colours last over a week if not longer and they are only £2.50 each. I bought most of mine in Lanzarote where they are €2 and occasionally I’ve spotted them for £2 in store. There is a blog post planned to talk about these in more detail so if you're interested make sure you stay tuned in February. I've also made a youtube video talking about these as well so if you'd like to watch the video as well it would be much appreciated. 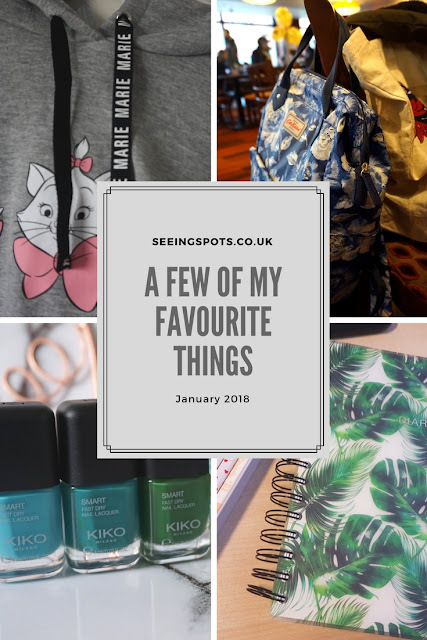 I'd love to know what you've enjoyed this month so make sure you leave me a comment with a few of your favourite things. 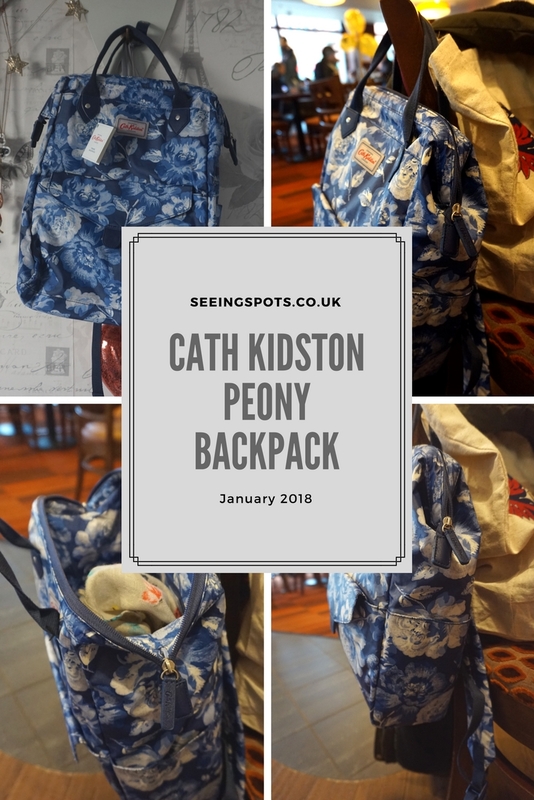 I’ve been a Cath Kidston fan for as long as I can remember but I don’t often buy from there as it’s above my usual price point if I’m being honest. There is also there is so many prints to choose from I can’t make my mind up and finally I don’t always like buying from somewhere, where it is so obvious that it’s that brand. Next can be a bit like that. Between Christmas and New Year, I did see a lot of adverts for sales and further reductions so like anyone would I clicked on the link and fell in love. I had spotted this peony print backpack in the pop-up concession in Manchester Arndale when I’d been Christmas shopping but at that time I was so annoyed they didn’t have the alphabet mugs with the initials I wanted I bit my nose off and wouldn’t buy anything from them! I’m a Taurus this should explain a lot. It has a wire frame around the opening and this can make it tricky to open and close on the go, but at this point, I’ve only used it a couple of times and I think in time this will be easier / I will work out a way of doing it easier. There is also an internal zip pocket and 2 small pouch pockets inside and as well as the outside pocket with a flap closure there are also 2 pockets on the side which would hold a water bottle or similar, but these don’t have any fastenings. Peonies are one of my favourite flowers, so this print is perfect for me and I like that it doesn’t automatically scream “I’m a Cath Kidston bag” there is a nod to the brand with the oilcloth style fabric and it has a fairly obvious label on the outside but from a distance I don’t think you would easily guess the brand. That might be me trying to kid myself and I do love a lot from the brand including all the really obvious CK prints but I just don’t know if I want to own them all. I am very taken with a lot of the Disney range, sadly the clothing only goes to a size 16 and were some great tops in the sale for a good price, but I know there is no point even trying to fit into them. 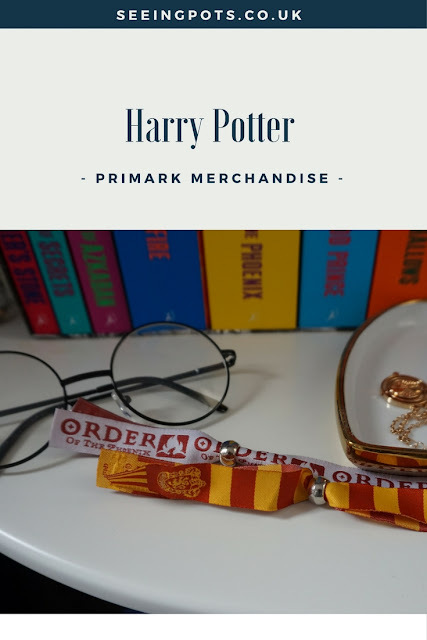 Harry Potter is everywhere now, last year was the 20th anniversary of the first book and Primark have stepped in to meet a lot of peoples needs/desire to be in the world of Harry and co. I hadn’t read the books for years and before Christmas, I treated myself to the box set of books and DVDs. I know the films are on TV a lot but I wanted to own them so I could watch them whenever I wanted. 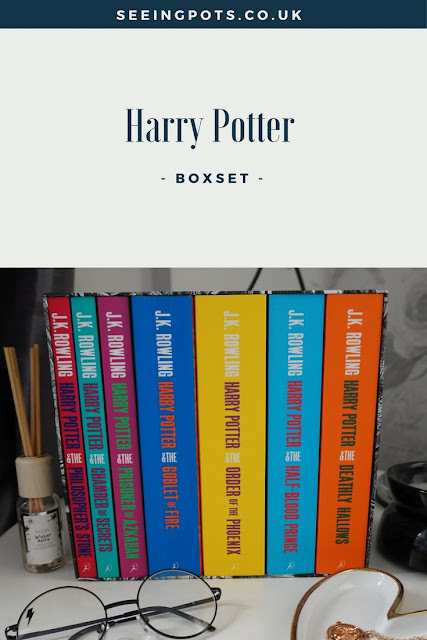 While I have no need for any Harry Potter Merchandise I couldn’t help but pick up a few items. I might need some of these later in the year but mainly I have just been sucked in and every time I pop in I pick something up. I’ve also got a couple of PJ tops and packs of socks which I haven’t included mainly because I forgot about them when I was planning this post. The tops are nice and soft and only cost about £4 each. One of the first things I picked up was a time turner necklace, this is very cute and doesn’t look overly Harry Potter unless you know the books/films you could wear it anytime. I also picked up a pair of the classic glasses and festival bands. I have a weakness for pin badges, but I often find they are quite expensive, I came across this pack of 6 badges for £3 in Primark in Manchester. Bags for life are always useful and again £3 well spent. The only item I regret buying (other than the glasses, I wear glasses so what use am I going to get out of these!) is the wand. It’s my most recent purchase and for £1.50 I don’t feel like I need to return it, but I have no use for it and it’s quite heavy. I might start writing spells and use it for that. It seems quite apt. I love my little stash of Harry Potter Merch and I expect I will pick more up on future visits to Primark. I can’t help myself, but I really should stop. As I’ve said some of these might come in handy later in this year but watch this space. Love her or loathe her you can’t fail to avoid the Zoella brand, personally, I like watching her vlogs and can’t help but think it’s impressive how she has gone from a blogger/vlogger to a brand. I have used several her bath and body products in the past and while I don’t feel the need to rush out and keep buying them, I do like a few enough to buy again and I like them enough to try new things when they come out. Personally, I’m happy to wait for sales and special offers. I won’t be queuing up for launch day of products or pre-ordering online, but I do get intrigued and want to try the products. 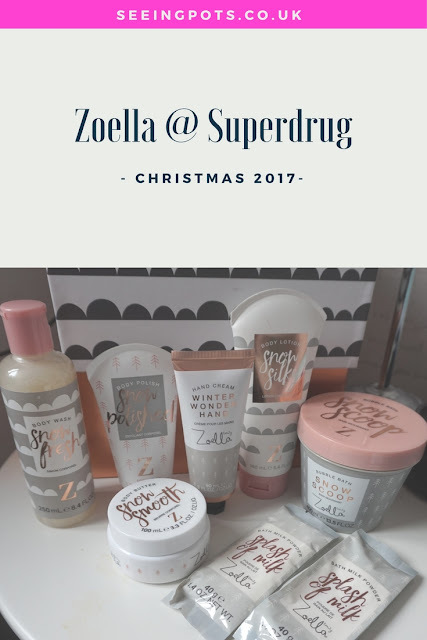 I called into Superdrug between Christmas and New Year to pick up a eyeliner and they had quite a few of the Zoella Beauty products in the half-price sale. These products have a fresh, sweet and clean scent. I do think it’s a little on the young side but I do like it. This Gift box contains 8 products and all but one of these appears to be full-sized or at least a very good size. This is bath milk powder, I’ve never tried anything like this below but I’m assuming it’s going to be a little bit like bath salts. I’m interested to try these and planning on putting them to this test this coming week. This is one product I possibly won’t use. I’m terrible at using body cream. I do try and use it and I go through phases but If I look in my product stash drawer it’s full of body creams. I will either give this to a friend at work or see if my mum wants it. From all the Zoella Beauty products I’ve tried the hand cream is one of the ones, I would happily buy over and over again. I’ve recently finished a tube of the original hand cream and I’ve been working my way through my other hand creams before I let myself buy another one so I’m very happy to have this one. Alongside the Snow Silky, I will most probably not use. Another one to pass on to friends and family. Although I really should moisturise, and this doesn’t seem to be a huge pot. I may keep this to take on holiday and see if I use it there before passing on. This is a body wash which I know I will use, I’ve liked and enjoyed using other Zoella Body Washes and I hope this will be no different. This will be going straight in the bathroom to be used once my snow fairy has been used up. One of the few products I’ve repurchased from a Zoella Beauty line is the body polish, I think it was the first one she brought out was my almost perfect scrub, I have high hopes for this and I’m looking forward to using it. I love the colours of this, which is an odd thing to say as it’s just a shower scrunchie, but it reminds me of raspberry ripple ice cream. It’s a small, compared to the soap and glory scrunchies but I’m more than happy with this and will keep hold of it to take on holiday. As much as I don’t use body lotion, it was worth getting this set for the fragrance alone. I can’t remember exactly how much I paid for the set, but I know friends who I can pass this on to. I love the scent of this and it will be perfect for an everyday work fragrance, I do own a few perfumes but I’m still in the mindset of saving things for best. I also get bored or scents quickly so I’m happy to have a few so I can swap and change. 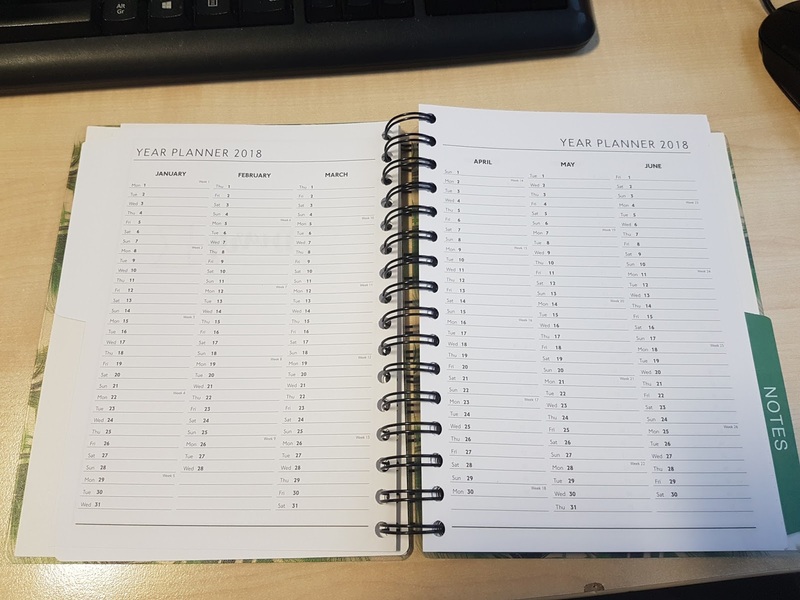 For the past few years, I've been trying to find the perfect planner. I've recently been using a Kikki K planner and I like it but it's still not exactly what I want. Especially when it comes to blog and youtube planning. I want something with a monthly view between each of the months. Rather than at the very front of the diary, space to plan and individual pages per day or week or there is plenty of other spaces in the planner. TK Maxx is a mecca of all things paper for me, they tend to have a lot of American brands which are much further advanced in all things planner than us in the UK. 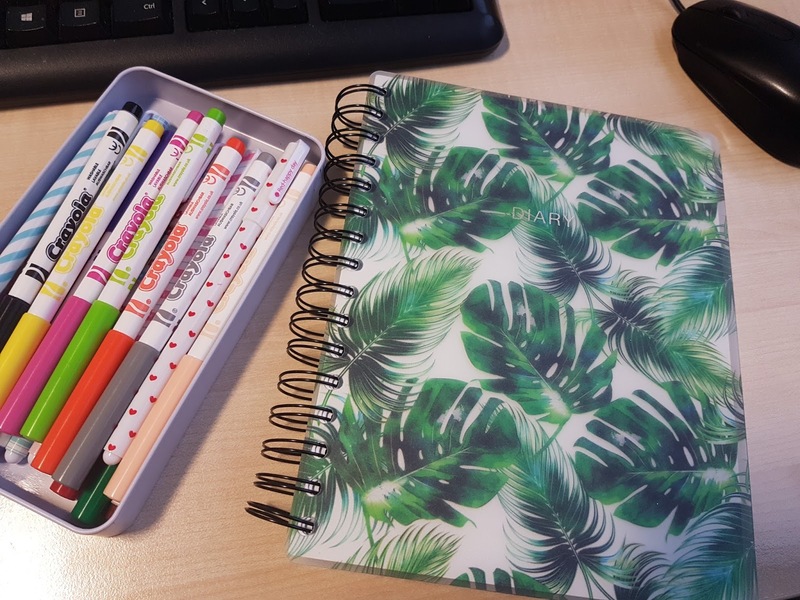 I found this leaf print planner for under £10 and when I flicked through it I thought it could be what I wanted from a planner. There are two main sections. The Diary and the Notes. The notes section is pretty generous and has a mix of paper types. It isn't just plain paper, there is a mix of dotted, squared, lists and boxes. The pictures below might make is a little bit clearer. I love the Bullet Journal style banners and flags throughout this diary. 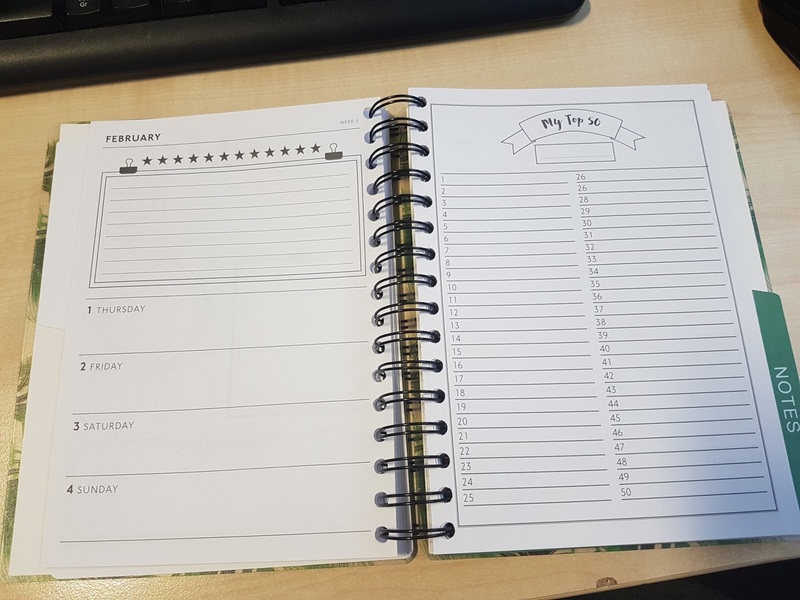 It also has some items you'd traditionally find in a diary such as the Year planner, there is also a 2019 year planner at the back of the diary section. I don't always use these sections but I do like the idea of them. 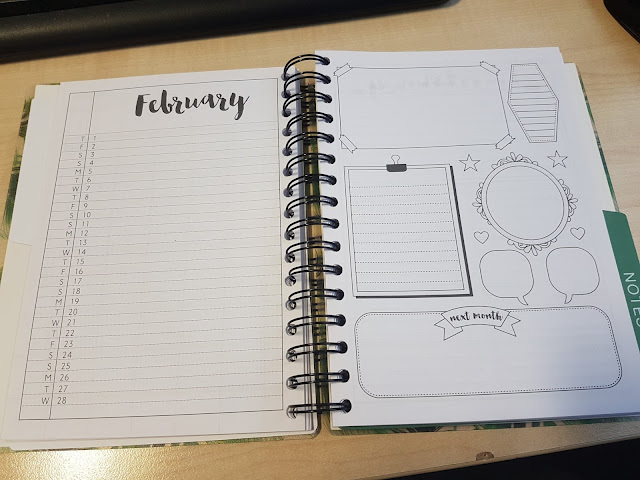 When I opened the January pages, I was quite excited as this is the sort of layout I've been looking for. I've already started using it before I took some pictures as I was eager to get started. I also like the week to view and a blank page. Each week has a different type of paper on the "blank page" For January I've tried to use them all to plan out my month but I'm sure this will change each month. 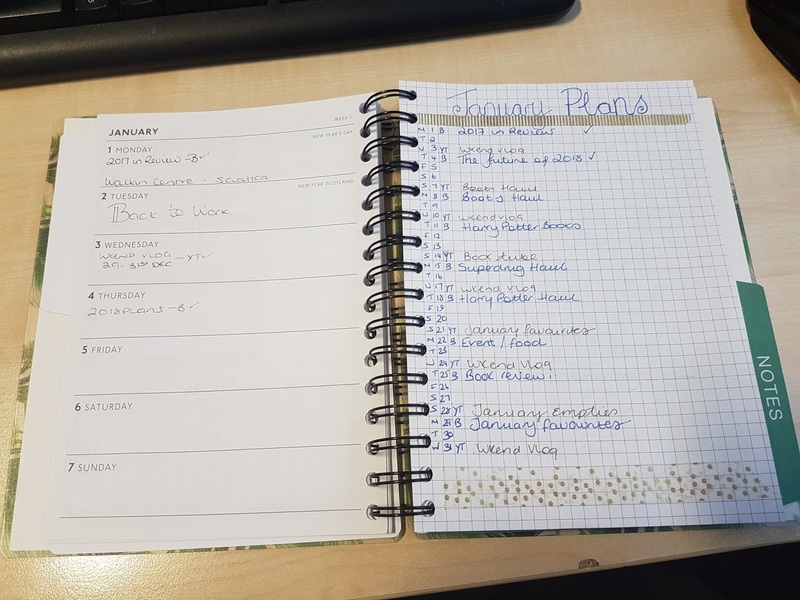 I'm using the square paper for Blog and Vlog planning. The pens I use are erasable so I can make changes as I go along without it getting too messy or needing to use correction fluid. 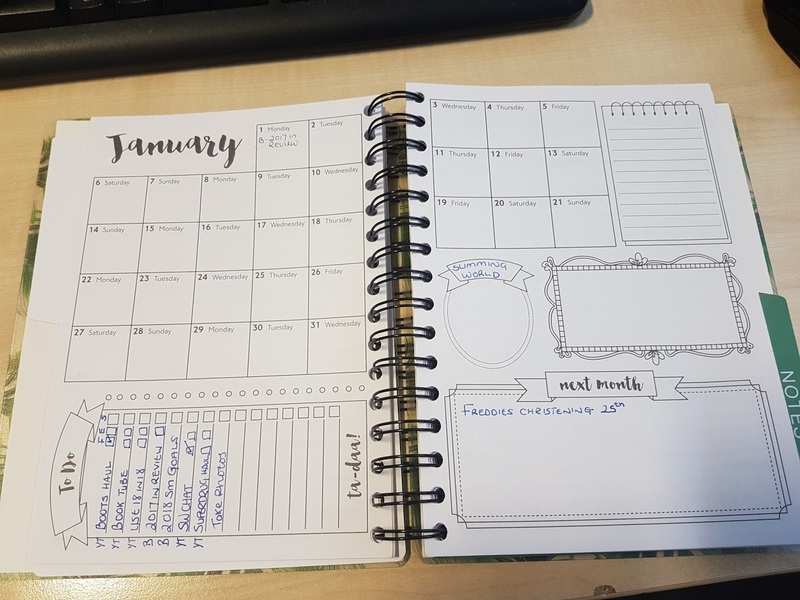 The boxes page has been a nice way of me displaying my yearly goals, I'm not sure this page will always be used like this or even used at all but it's a cute page and has come in handy for January. This paper is quite a decent weight, the colours do show through as a shadow but they haven't bled through which is always a bonus. 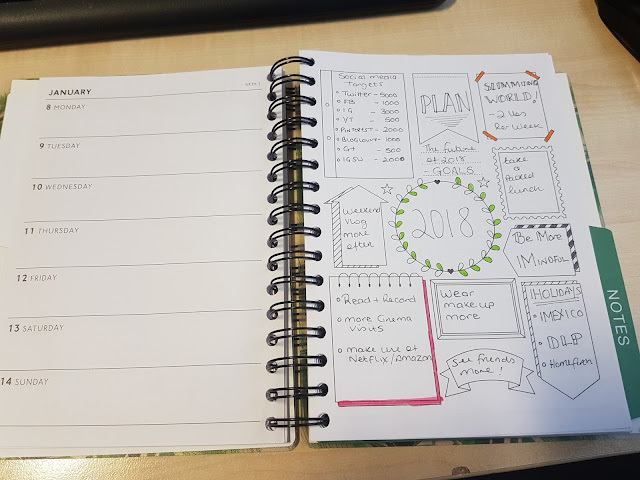 I'm going to use the dotted page as a bit of a checklist but as I've never used this system before I'm not sure I like it now I've started it. All I can do is try and it won't be the end of the world if this is he only month I try it. 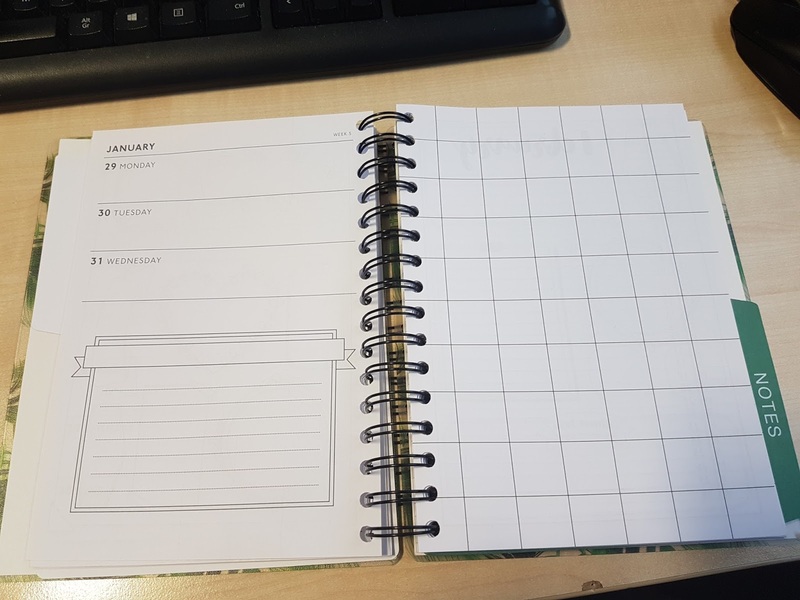 Because there is a clear cut off at the end of each month where there is space they have included boxes to fill the space, I'm also not keen on the giant squared paper but it's not the end of the world. Most months follow the above format but February, June and October have the list format rather than the calendar design. I would prefer the calendar boxes but again I can cope with it and I will use it. I'm only a few days in using this but I'm really happy with it. I like the look and layout of it and there is so much note paper I can use that to plan posts. Most Diaries I've had have things like dialling codes, conversions etc at the beginning. This has them at the back of the Diary section. 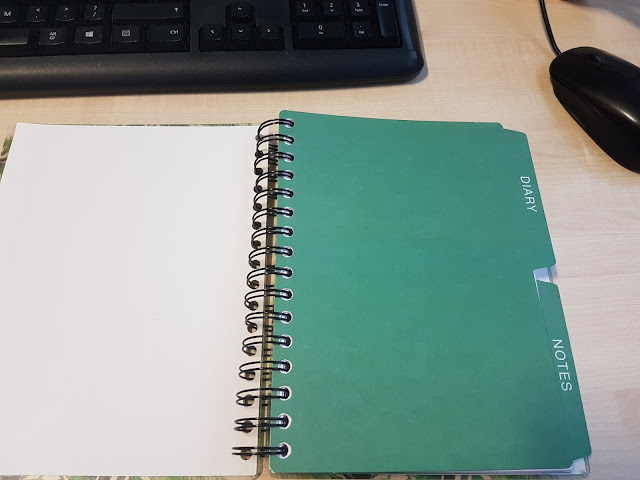 I can't say I've ever used them but I like that they have them at the back rather than having to wade through 5 or 6 pages to get into the diary itself. 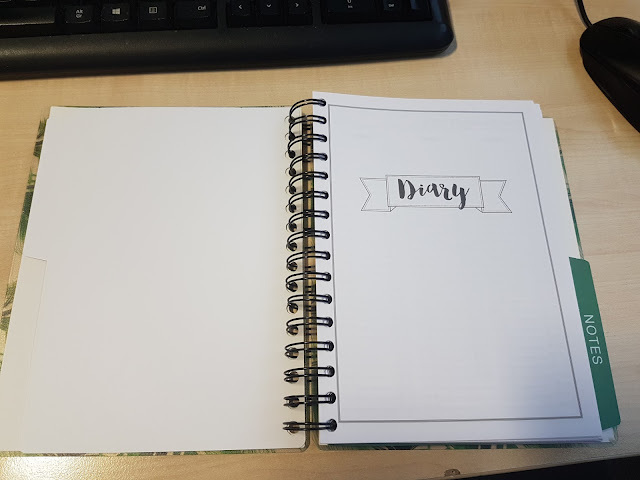 This diary also includes pages to note down websites and address pages as well as some lined paper before the notes section. As mentioned above the notes section is a heaty section and is a mix of the square, dotted, giant squares and cute boxes.